This is a continuation of my last post.. same outfit, different shoes. Angie and I happened to be wearing similar outfits, so we had to take some pictures together. I really like the way these came out! We're trying to find some new locations to take pictures cause we're getting a little bored of the area in front of her apartment. So we found this railing outside her apartment complex's rental office. We also took some pictures in the Burger King parking lot, which I'll be posting later this week..
LOVE THESE PICTURES!! Might be ur best yet! Im still in love with ur boots and have been looking for similar ones everywhere! I love you guys together man, um... following both. There is nothing like stylish friends it's always so much fun to take pics together. She's fab + Your fab = Double fab!! i want your shoes!!! ive been looking for a pair like one those for ages!! GENIALES las dos. Y muy chulas las fotos! come to see my archive. 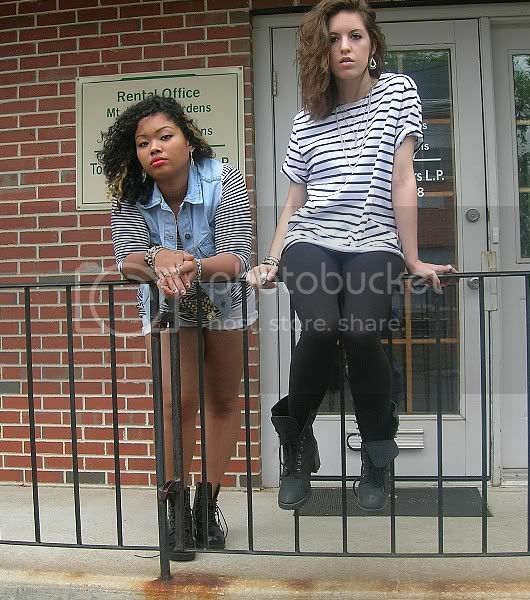 you and your friend look amazing, loving the stripes + lace up boots!! nice pics!! I like ur shirt!! It`s so navy, just like i like them!!! Thanks for ur comment!! xoxo!! They came out sooooo goooood!!!!! !